Since 2005 Momo has been head-quartered in Milan, Italy with a subsidiary in the US, Momo USA. 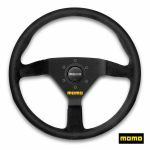 They sell their products for the aftermarket and motor racing in over sixty countries, mainly through distributors and dealers all over the world, under the brands “Momo” and “Momo Corse”. Momo is still predominantly focused on light alloy road wheels, but the Company has brilliantly carried on the business of developing innovative racing products, incorporating ambitious technological goals and continuing to improve the quality, the safety and and the superior design of Momo products.